TOKYO -- Mazda Motor Corp. may revise its plan to raise exports because of stagnating demand in the U.S., said CEO Takashi Yamanouchi. "We will keep our overall framework for our midterm plan, but we may change some parts," Yamanouchi said in an interview at the Tokyo Motor Show Wednesday. "We're studying about whether to maintain our plan to raise our export ratio to 85 percent from 80 percent,'' he said. The automaker had hoped to boost U.S. sales to about 400,000 units by 2016 as part of a strategy to sell 1.7 million autos worldwide in the same period, Yamanouchi said earlier this month at the Los Angeles Auto Show. 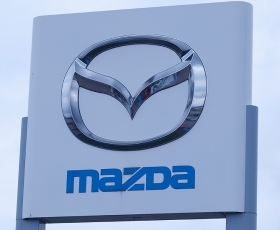 Mazda, along with other Japanese automakers including Toyota Motor Corp. and Honda Motor Co., is struggling to stay competitive in the U.S. as the yen's gain against the dollar makes Japan-built autos less profitable to export. Mazda's U.S. sales rose 8.7 percent this year through October to 209,641 units. The carmaker expects sales in North America to climb 10 percent from a year earlier to 376,000 units in the 12 months ending March, according to its earnings forecast given on Nov. 2. Sales of Mazda cars in the EU and EFTA countries fell 27.6 percent in October to 8,445 units, according to industry association ACEA. Ten month sales of the brand fell 23.7 percent to 121,352.